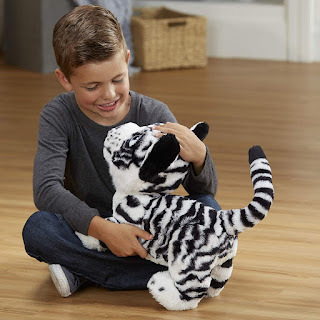 Amazon has the FurReal Roarin’ Ivory, The Playful Tiger Interactive Plush Toy on sale for $46.23 (regularly $109.99). Roar at her or make a noise, she responds by roaring back! Incredibly realistic pet responds to sounds and touch with 100+ sound-&-motion combinations. Makes a lot of different noises. Some of them are weird. Does everything as advertised. Was not disappointed. Love the glittery purple eyes.